The average price of a Canadian home increased 10.4 per cent to $389,119 in December, compared to the same month in 2012. 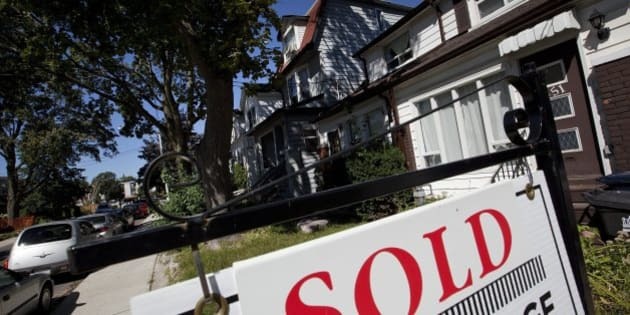 The Canadian Real Estate Association (CREA) released data Wednesday showing that a total of 457,893 homes changed hands in Canada last year, an increase of about 0.8 per cent from 2012's level. "Absent further mortgage rule changes," CREA's chief economist Gregory Klump said, "sales in 2014 may surpass the annual total for 2013 if demand holds steady near current levels as strengthening economic and better job growth offset the impact of further expected marginal mortgage interest rate increases." As has been the case for some time now, CREA says the large jump in prices was largely due to what was happening in Canada's most active and expensive markets. Sales activity in December 2012 in Toronto and Vancouver was abnormally low, which dropped the national average at that time. "Removing Greater Vancouver and Greater Toronto from national average price calculations cuts the year-over-year increase to 4.6 per cent," CREA said. CREA says the average price can be misleading, as it can be too easily influenced by individual factors. The realtor group says its MLS Home Price Index "provides a better gauge of price trends because it is not affected by changes in the mix of sales activity the way that average price is." That index shows home prices rose 4.31 per cent over the past 12 months. Gains were seen in all housing types. The index was led by an 8.7 per cent gain in Calgary and a 6.3 per cent gain in Toronto. Vancouver's market index posted a second straight increase of 2.13 per cent after declines for much of the time between late 2012 and late 2013.